Kinnaur district in the Himalayan state of Himachal Pradesh is located in an incredible landscape comprising the lush green of the Sangla Valley and the Hangrang Valley amidst the pine woods and apple orchards. Flanked by imposing mountains of the Himalayas and Dhauladhar range, Kinnaur district is full of scenic villages and valleys where visitors can explore the stunning beauty of the place and its culture. Beautiful villages like Sangla, Karchham, Rukchham, Chhitkul apart from beautiful alpine meadows, are all worth visiting. Sangla Forest Rest House is the accommodation option here. Rekong Peo, the headquarters of the Kinnaur district is another important place. Known locally as ‘Peo, Rekong Peo is home to Kinnaur Kalachakra Celestial Palace. 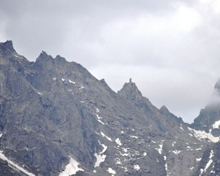 14 Kms from Poari and 7km from Rekong Peo, Kalpa, located at an elevation of 9800 feet, is home to the majestic Kinner Kailash (19800 ft). 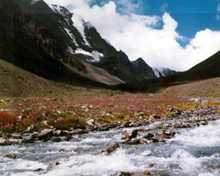 Kinner Kailash has religious significance because it is considered to be the winter abode of Lord Shiva. Buddhist Hu-Bu-Lan-Khar monastery, Narayan-Nagini temple and Durga temple are the holy places at Kalpa. 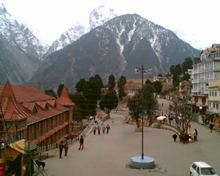 Hotel Kinner Kailash and Kalpa Circuit House are the staying facilities here. 3 kms from Rekong Peo, Kothi, also called Koshtampi, is home to the Chandika Devi Temple. One of the most venerated shrines of Kinnaur. Another famous shrine located in Kothi is the one dedicated to Bhairo. 16 kms from Poari, Ribba or Rirang is noted for the local brew “Angoori” made from grapes. The village is surrounded by pines tress. 26 Kms from Poari, Morang is known for its apricot orchards. PWD Rest House is available for accommodation. The village is located above the left bank of the Satluj River. 58 Kms from Poari the small village of Pooh is the place where the Pandava brothers of the Mahabharata fame are said to have spent some time during their exile. Pooh is 71 km from Reckong Peo. Stretches of green fields, orchards of grapes, vineyards, almond and grape add to the charm of the place. Accommodation can be found here in the PWD Rest House. Located in the Hangrang Valley, the quaint village of Nako is home to a small sacred lake. Located at an altitude of 3660 meters above sea level amidst the majestic snow-peaked mountains, the emerald green Nako Lake will be an assault on your senses. A 5 hour drive from Recong Peo, Nako is home to a Buddhist monastery and temple of Padmasambhava. Lipa-Asrang Sanctuary, Rakchham Chhitkul Sanctuary and Rupi Bhaba Sanctuary are destinations for the wildlife lovers in Kinnaur district. By Rail: the nearest railway is Shimla which is connected by a narrow gauge railway line with Kalka (96 km) which in turn, is directly connected by rail to all the major places in India. Shimla is a 96 km journey on the narrow gauge toy train from Kalka. This train has been given UNESCO World Heritage status in 2008. By Road: Located on the NH-22 (Hindustan-Tibet Road) Kinnaur can be best approached from Shimla which is about 250 km away. Bus services are available from Shimla and Rampur to the various towns and places in Kinnaur district.